1953 was an important year for Ford trucks. Ford pickups were 50 years old and Ford launched the first F-100 pickup. A 50 year anniversary horn button was installed in 1953 Ford trucks. The new F-100’s were a little larger inside the cab and more attention was paid to styling over the F1. 53 was also the last year of the Flathead V8 engine, making the 53 Ford truck an interesting transition between the first 50 years of Ford trucks and the last 30. 1953 Ford trucks came with a 6 volt wiring system, vacuum wiper system, straight front axle with drum brakes and no turn signals. Optional equipment consisted of a Deluxe package made up of 6 chrome “teeth” on the front grille and chrome gull wing surrounds on the side of the hood. 3 Engine options were available: O.H.V. 6 Cylinder-215 cid, L-Head 6 Cylinder-254 cid and the L-Head 8 Cylinder-239 cid (Flathead). Most 53 F100 trucks came with a 3 speed transmission shifted on the column. V8 trucks had a chrome V8 emblem on the center of the grille while 6 cylinder trucks had a chrome 3 pointed star. Most parts interchange between 1953 – 1955 F100 trucks and some 1956. 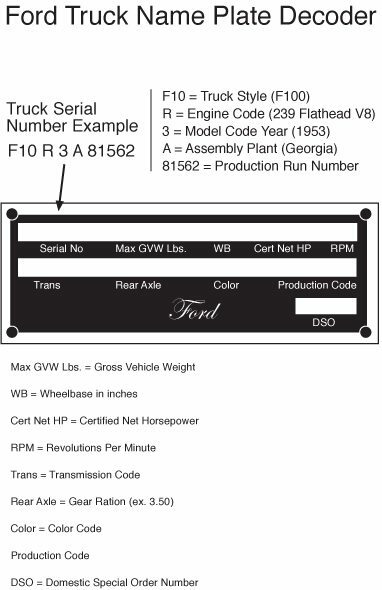 53 – 55 ford trucks are basically the same except for trim and engine options. The grille on the 53 F100 is unique to that year. Front parking lights are the same on 53 and 54 F100 models, as well as the lower valance that runs below the grille. Gull wing chrome and the F100 hood emblems are the same on 53 and 54 F100 trucks.